Hello There! Welcome to Nemerulez' Blog: FOOTSTEPS! A VERY DEEP, INSPIRING GUEST POST! Deep in his slumber, one night a man had a very real, yet surreal dream. He dreamt that he was walking along the beach with God. As he looked up at the sky, he saw all the scenes of his life flash by along with two sets of footprints: one set for himself, and another for God. After all the scenes had flashed before him, he looked back at those footprints and noticed something quite disturbing: At the most difficult times in his life, he saw only one set of footprints. This deeply troubled the man, so he turned and said to God: "You said that if I followed you, then you would always walk with me through thick and thin. 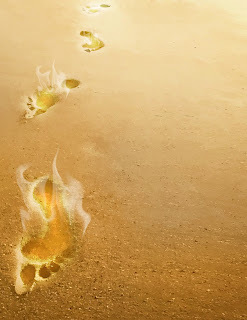 In looking back, I see that during the most painful times there is only one set of footprints. Why did you leave me when I needed you the most?" "I love you and would never leave. It was during those times when you suffered the most that I carried you."